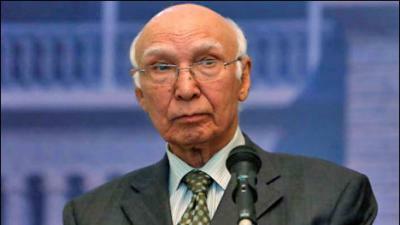 ISLAMABAD: Advisor to Prime Minister on National Security and Foreign Affairs, Sartaj Aziz said on Sunday that Pakistan’s Foreign Secretary will visit India when his counterpart will invite him for the resumption of dialogue process between the two countries. Speaking at a forum of Think Tank of Islamic Countries, he said that although the recent visit of Indian Foreign Secretary Subrahmanyam Jaishankar was in the context of SAARC countries’ visit but the two foreign secretaries met and discussed all the issues including the core issue of Jammu and Kashmir. He said despite no breakthrough in this meeting, there was headway for the next meeting of the two foreign secretaries. Aziz went on to say that Pakistan wants to resolve all the issues including Jammu and Kashmir, Siachin, Sir Creek and other disputes with India through dialogue process. He further said in 1999 during the visit of the then Indian Prime Minister Atal Bihari Vajpayee, there was important development in the bilateral relations between Pakistan and India but due to the Kargil issue the relations were disturbed again. He added that there is a long way to be travelled between India and Pakistan to resolve all the issues but it needs comprehensive dialogue process between the two countries. Replying to a question the Advisor said SAARC summit 2016 will be hosted by Pakistan and all the leaders of the SAARC countries will be invited to attend the summit. He expressed the hope that all the SAARC leaders including Indian Prime Minister Narendra Modi will attend the next summit. Answering a question about relations between civilian government and the military establishment, Aziz said that both are on the same page and cooperating with each other on all the issues especially in the current war against terrorism. Regarding the visit of the Chinese President to Pakistan the Advisor said dates were being finalised for the visit in the near future. He however said it was not possible on March 23. Aziz went on to say that President Mamoon Hussain will undertake an official visit to Azerbaijan to promote economic security, cultural and people to people ties. He added that Pakistan wants investment from Azerbaijan in various fields especially in the energy sector and expressed the hope that the visit of the President would promote trade and economic ties. The Advisor further said there has been progress on the reconciliation process between Afghan Taliban and Afghan government adding that Pakistan was ready to help and facilitate the Afghan led and Afghan owned reconciliation process.